Light, fresh, and delicious orzo salad that comes together quickly and easily. Perfect anytime! Fill a large pot with about 4 quarts of water and bring it to a boil. Add about a tablespoon of salt to the water, then add the orzo. Cook for 7 to 8 minutes, stirring frequently until the orzo is tender but still firm to the bite. Meanwhile, make the vinaigrette by mixing the vinegar, lemon juice, agave, salt, and pepper in a blender. With the mixer on low speed, slowly begin drizzling in the oil. Season the vinaigrette with additional salt and pepper, to taste, if desired. Pour the cooked orzo into a fine mesh strainer and rinse under cold water. Strain and transfer the orzo to a large bowl. Toss with beans, tomato, onion, basil, black olives and just enough dressing to coat; about 2/3 cup (or more) to taste. Season the salad, to taste, with salt and pepper, and garnish with additional freshly chopped basil if desired. Serve chilled or at room temperature. 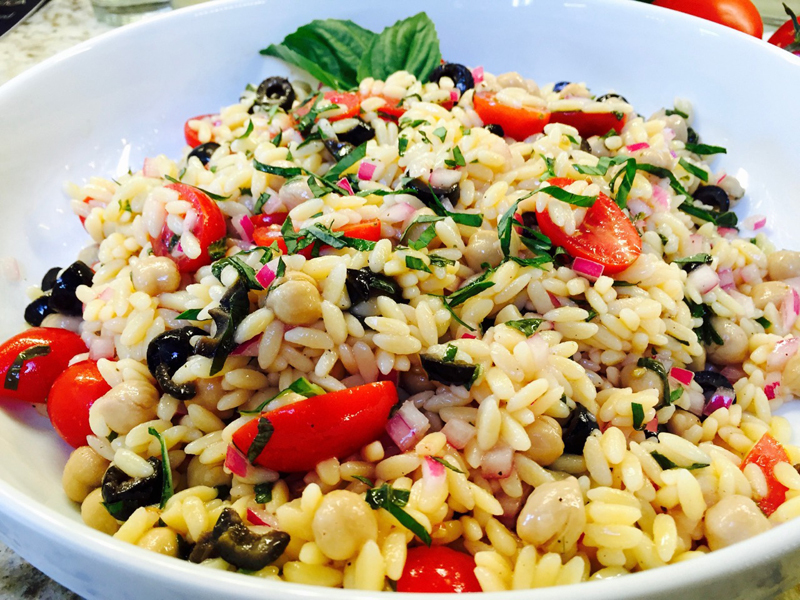 *To make this orzo salad gluten-free, use a gluten-free orzo pasta!